TCEP (Tris-(carboxyethyl) phosphine hydrochloride) is a type of reducing agent that is often used in biochemistry and molecular biology. TCEP is often used as a reducing agent to break disulfide bonds within and between proteins as a preparatory step for gel electrophoresis. TCEP has nearly an equivalent reducing potential as DTT, but is more stable than DTT in EDTA-free solutions, has a broad pH range, is irreversible, more hydrophilic and resistant to oxidation and is also nearly odorless. 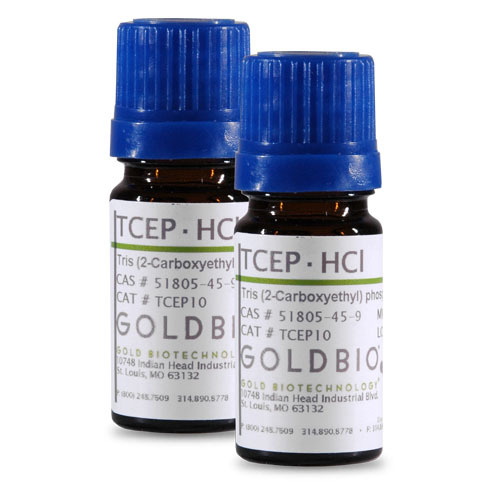 GoldBio’s TCEP is Proven and Published™ to ensure a quality reagent with optimal potential. TCEP-HCl is an odorless reducing agent suitable for protein applications and in the preparation for electrophoresis. TCEP is water soluble, is stable in a variety of solutions and is particularly useful in the labeling of cysteine residues with maleimides, preventing the cysteines from forming disulfide bonds. As a reducing agent, TCEP has many other desirable features.